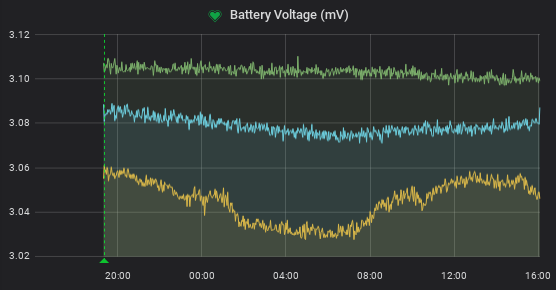 That does indeed look odd from 6:00 to 8:30 it looks normal, except that voltage is increasing, which sounds like the load has been smaller at that time. Could be either bad contact with the battery or something really wrong with the tag. Have you tried to gently wiggle the battery clip against the battery surface as well as rotating the battery while the battery is inserted to tag to make sure there’s no excess dust or grease? I tried using Keka to unzip it. Does not ignore the wrong checksum. Worse yet, I had a previously unzipped copy of the image and tried it on a brand new Pi 3B (not the B+ that I spoke of in this thread) and the Pi fails to start up. dbus.socket: Unit lacks Listen setting. Refusing. Didn’t have ANY issues with the last fresh load of ruuviberry onto a new Pi 3B. Any ideas? I’ll also research the error logs elsewhere, but thought someone might have already had this experience. The Raspberry acts as a WiFi hotspot, SSID “RuuviGW” and password “ruuvi-gateway”. Grafana user/password is admin/admin . Port 80 is redirected to port 3000 (Grafana) and everything should start on boot. I haven’t yet had a chance to download, unpack and flash the image to verify the integrity, maybe tomorrow. The prepared image works fine. For some use cases it may be good to downsample the data. E.g. after one year with 5 ruuvitags I got problems with the amount of data in the database. Because I have to search a little bit to get it working, here is an example how to set up downsampling. In this example the original data will be stored for 7 days, and deleted after this time. For long term storage 30 minutes mean values of some measurements will be stored. Connect to raspberry shell and type influx to start the influx db command line interface. Change the duration of the default retention policy to e.g. 7 days. So that after 7 days the detailed data will be deleted. Create a continuous query for the data that you would like to store long term. mean(pressure) as “mean_pressure”, mean(batteryVoltage) as "mean_batteryVoltage"
Isn’t it port 3001? Or did that change in this image? Never mind. I must have changed it to 3001 on my very first install and propagated that through my own image when the online image got corrupted. My bad. After update, you may boot 3B+ with the card. Tags work reliably with 3B+, but just as a side note, there seems to be temperature compensation problem with tags. I have one tag monitoring Green House where temperature changes during the night. That seems to affect readings that should be otherwise stable, like battery voltage and acceleration. See graphs (Brown line is Green house, others are inside the house). As you can see Acceleration changes only with GreenHouse sensor but no others (so it’s not moon affecting Earths G). Is/should Ruuvi use voltage regulator instead of relying on battery voltage, which is known (because of Lithium) to be affected on Temp. In Bosh chip data sheet there is instructions on compensation of readings, are they applied? I haven’t check accelerometer chip data sheets what it says about compensation. Our tomatoes can live with this error, but if more certainty on readings is needed, one way is to (Temp) calibrate sensors and apply corrections to DB. Nice work with Ruuviberry image and Ruuvi Collector! PS: In case someone has Bluetooth problems with PI after using BT keyboard or mouse, you must ‘unpair’ them first, to allow BT adapter to go to HCI-mode. Wireless keyboards etc. are HID devices and cannot be used at the same time (not even configured). The battery voltage really varies with the temperature, so there is nothing to compensate. Both humidity and pressure calculation use temperature when converting from raw ADC value to physical value. Accelerometer is not temperature compensated, as STM does not provide any kind of compensation curve. Is there a change log or something for the ruuviberry image? I got 2018-05 image without e.g. apache and trouble setting date and getting network via ethernet. I have to run sudo hciconfig hci0 reset first to get it to work. There’s no changelog, but you can find the description of image at https://lab.ruuvi.com/ruuvitag-fw/ . What version of Raspberry Pi you’re running? Grafana shows all tags by mac on default, you can configure the aliases if you want to.